Last July 20, the multinational electronic and hardware manufacturer, Acer, launched its annual Acer Day at the Glorietta Palm Drive Activity Center. People enjoyed Acer’s event themed “Play Music Together” because of the live performances made by G-Force, Moira dela Torre and IV of Spades. Acer Day was first introduced last year throughout 14 countries across Pan-Asia Pacific. This year, the fun expanded as Australia, Bangladesh, Brunei, Cambodia, China, Hong Kong, India, Indonesia, Japan, Korea, Malaysia, Mongolia, Myanmar, New Zealand, Singapore, Sri Lanka, Taiwan, Thailand, Vietnam and Philippines celebrated Acer Day 2018. Acer wanted to embody how music was classic, but manages to be youthful, trendy and innovative. Therefore, Acer products were designed fresh, modern and inventive. 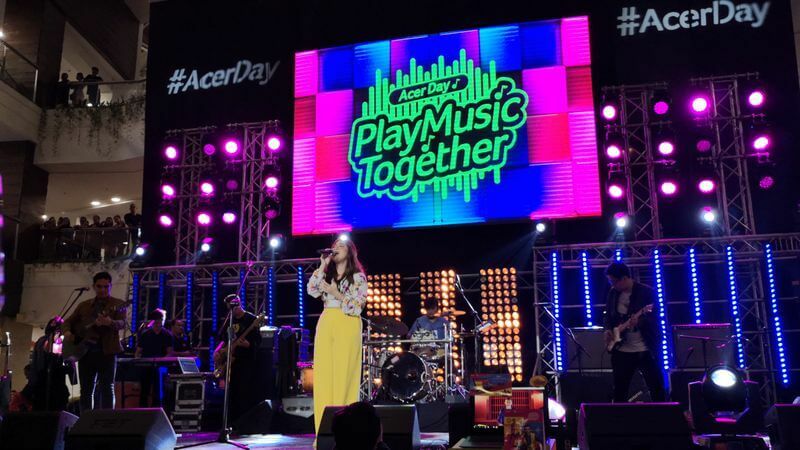 To “Play Music Together”, Acer Philippines invited the trendy Moira dela Torre and booming IV of Spades band that kept the eyes and ears of the audience entertained. The dance troupe, G-Force, pumped up the crowd with their slick and amazing dance moves. Along with the celebration of Acer Day, Acer stored more treats, promos and prizes for us as the celebration extends until September. Starting July 20, the Acer Day website will be available for customers from around the world to complete tasks and challenges to get the chance to grab awesome gifts and giveaways like free travel to Taiwan for two (2) and Acer laptops. Moreover, from August 3 to September 17, simply video yourself doing the Dance challenge in the Acer shirt and cap at any of the 33 Acer Concept Stores then upload it on Facebook and tag 30 friends to get Php1,000 off on your purchase of any qualifying Acer product. Even bigger, those who successfully complete all challenges can get Php5,000.00 off outright from their purchase of any Swift, Spin, Nitro, and Helios model. Heads up for all amateur and professional dancer groups. Get a chance to be one of the 3 finalist who will each get Php100, 000 each and compete for the grand prize by simply following the Acer Day signature dance by G-Force. For more information and updates about Acer Day activities and promotions, visit the Acer Philippines Facebook Page or the Acer Day website.